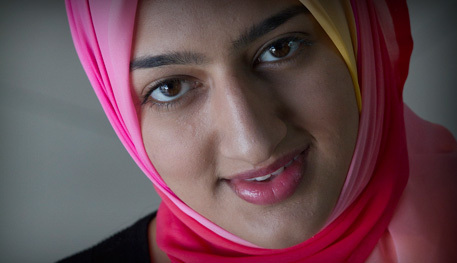 Humaira h Jassat left school last year, lives in Gauteng, South Africa and is now studying journalism at Varsity college. She also happens to be one of the most inspiring young people I have ever met. She grew up in what she describes as a “nice, Muslim family”. She never lacked for anything, but began to realise, as a young teenager, that there was more to life than academic study. Her school really only focused on exams, but she discovered the President’s Award and this widened her horizons considerably. She began to meet young people from outside her immediate community, began to take part in service activities and began to discover adventure. When she was in Grade 11, one of her teachers contracted breast cancer. No-one in her community talked about this. It is simply not done to discuss such things. Humairah wasn’t happy about this. She discovered that a significant number of women in her community, Azaadville, south of Johannesburg, had died of the disease in recent years. But nothing was being done in the community to inform women of the risks of breast cancer. So, Humairah decided something needed to be done. Whilst online, she found out about an American campaign which encouraged Muslim women to wear a pink hijab to raise awareness of the disease. If this happened in the USA, why could it not happen in South Africa? Humairah approached her headteacher and asked whether the school could adopt the campaign. With the school’s relatively lukewarm approval, Humairah phoned up the other Islamic schools in South Africa to tell them about her idea. For one day, girls and young women should wear a pink hijab and make a donation of two Rand to the Cancer Association of South Africa. Well, it did. October 29th 2008 saw thousands of girls and young women donning the pink hijab. Humairah’s project reached friends and families acquainted with breast cancer sufferers and extended beyond race, culture and religion. Upon the phenomenal success of “Pink Hijab Day” in 2008, she has taken it upon herself to landmark this as an annual event and is proud to be deemed the “Pink Hijab Girl”. But what was the achievement she wanted to tell me all about? Getting her Gold Award, of course.